The first psalm of Book Four begins to answer the crisis of faith that was so strong in Book Three. It is a serious, somber poem that expresses in prayer the needs and hopes of God’s people. It is full of faith and it is full of longing. The title tells us that this psalm is a prayer of Moses. It is the only psalm attributed to Moses in the Psalter, and it takes us back to both creation and the covenant at Sinai for comfort. As we will see, it reverberates with the language of Deuteronomy. We will explore this psalm through one of its best-known verses: “Teach us to number our days that we may get a heart of wisdom,” (v. 12). This verse is often treated as if it were a proverb that means, “Life is short, so live wisely.” But in the context of the whole psalm, it means much more than that, as we will see. It is a key part of a meditation on God and on living as the people of God. In Hebrew, verse 12 begins with the words, “to number our days.” This phrase picks up the theme of time that is so pervasive in this psalm. A reflection on time leads us to see how weak we are and how short our lives are: “You return man to dust and say, ‘Return, O children of man!’ You sweep them away as with a flood; they are like a dream, like grass that is renewed in the morning; in the morning it flourishes and is renewed; in the evening it fades and withers. The years of our life are seventy, or even by reason of strength eighty; yet their span is but toil and trouble; they are soon gone, and we fly away,” (vv. 3, 5-6, 10). 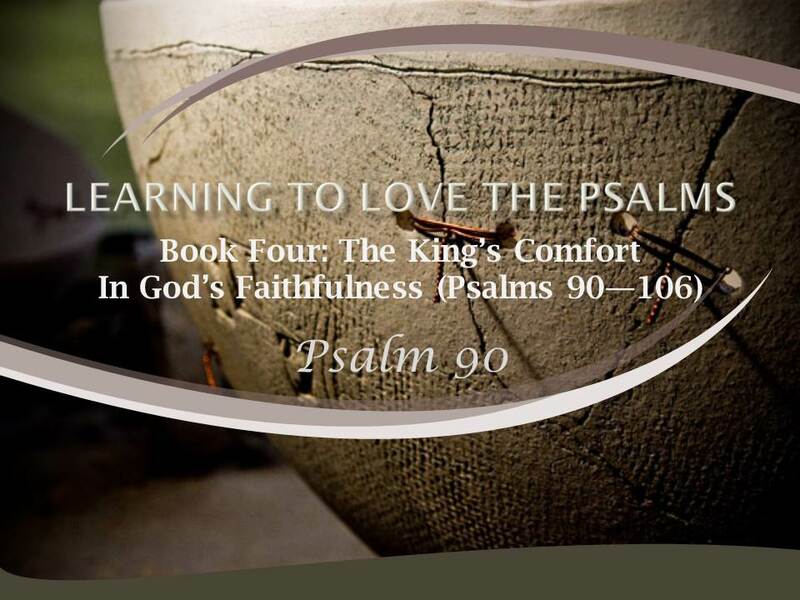 Here, Psalm 90 shows its connection to the concerns of Psalm 89 about man’s frailty: “Remember how short my time is! For what vanity you have created all the children of man! What man can live and never see death? 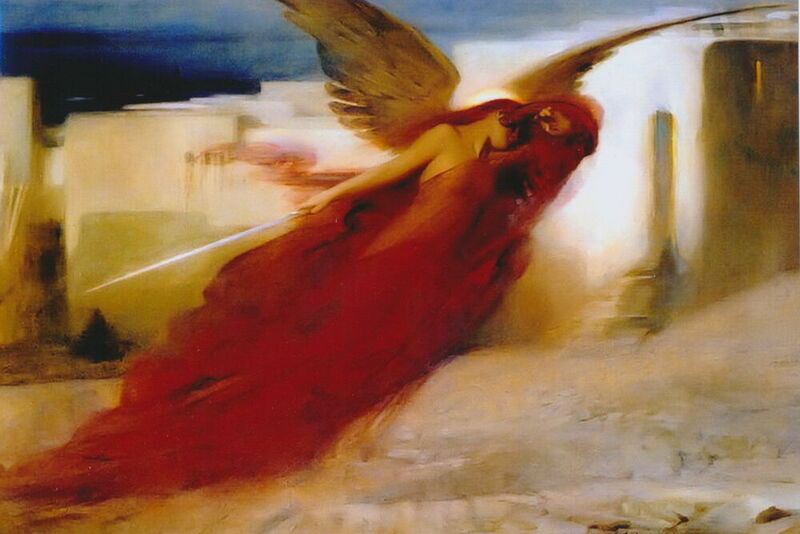 Who can deliver his soul from the power of Sheol?” (Psalm 89:47-48). Such realism about our weakness is the necessary foundation of any true wisdom. “O Lord, make me know my end and what is the measure of my days; let me know how fleeting I am,” (Psalm 39:4). The shortness and weakness of human life are the fruit of sin and judgement in the world. The psalmist acknowledges that sin frankly, saying, “You have set our iniquities before you, our secret sins in the light of your presence,” (Psalm 90:8). He knows that his holy God visits his judgment on sinners. “For all our days pass away under your wrath; we bring our years to an end like a sigh. Who considers the power of your anger, and your wrath according to the fear of you?” (vv. 9, 11) It is surely frightening to think that God’s wrath will equal all the obedience that is due to him. Although life is short and the wrath of God terrifying, the mercy and protection of God for his people are great. God is the home of his people: “Lord, you have been our dwelling place in all generations,” (v. 1). Through all the generations of his people’s existence, reaching back all the way to creation, God has always preserved and protected his people. Even in the Garden of Eden, he promised that he would redeem his own, (Genesis 3:15). God remains the home of his people because he is the redeeming God. Moses reminds us that while the life of man is frail and short, God is eternal. “Before the mountains were brought forth or ever you had formed the Earth and the world, from everlasting to everlasting you are God,” (v. 2). Moses takes us back before God created the Earth to remind us that our God is before and beyond time and this world. He has always been, and he is sufficient to himself without us. Moses makes this point in another way in verse 4: “For a thousand years in your sight are but as yesterday when it is past, or as a watch in the night.” Time does not have the same meaning for God that it has for us. For us, a thousand years is a time so long that we cannot really imagine experiencing it. For God, it is no different from a very short period of time. He is eternal, above the time that he created. This eternal God directs the course of history by his infinite power. Moses, who had seen the power of God often displayed in the deliverance of Israel from Egypt, continues to pray that the majesty of God’s works would remain before the eyes of the people: “Let your work be shown to your servants, and your glorious power to their children,” (v. 16). As God had brought suffering by his power, so Moses prays that God will send blessing: “Make us glad for as many days as you have afflicted us, and for as many years as we have seen evil,” (v. 15). If our need is to number our days by contrasting their shortness with the eternal nature of God, then our prayer to God is that he would teach us: “Teach us to number our days.” We will never learn that lesson in our own strength. We are not only ignorant if left to ourselves, but we suppress the truth in unrighteousness, (Romans 1:18). We convince ourselves that we have a long time to live, and as long as we are healthy, we really believe that we will live forever in this body. We need a teacher, and the only teacher who can rescue us from ourselves is God. The Bible tells us over and over that God teaches his children. “The Lord has made known his salvation; he has revealed his righteousness in the sight of the nations,” (Psalm 98:2). “He made known his ways to Moses, his acts to the people of Israel,” (Psalm 103:7). This God teaches us that he is our protector and strength: “The eternal God is your dwelling place, and underneath are the everlasting arms,” (Deuteronomy 33:27a). We pray that God will be our teacher for a purpose: that we may gain a heart of wisdom. If God teaches us our weakness and his strength, then we are set on the path of wisdom. Wisdom is living in the light of God’s character and work. So the psalmist prays, “Satisfy us in the morning with your steadfast love, that we may rejoice and be glad all our days,” (v. 14). God calls on his people to ask him to teach them wisdom. The Book of Proverbs reminds us: “If you call out for insight and raise your voice for understanding, if you seek it like silver and search for it as for hidden treasures, then you will understand the fear of the Lord and find the knowledge of God. For the Lord gives wisdom; from his mouth come knowledge and understanding,” (Proverbs 2:3-6). The New Testament makes the same point in the letter of James: “If any of you lacks wisdom, let him ask God, who gives generously to all without finding reproach, and it will be given him,” (James 1:5). Interestingly, the context of James’s statement is similar to Psalm 90: both seek wisdom to explain suffering. God’s people find his wisdom especially in the holy instruction of his covenant. “Blessed is the man whom you discipline, O Lord, and whom you teach out of your law,” (Psalm 94:12). Indeed, Moses taught Israel that the law was her wisdom: “Keep them [the decrees and laws] and do them, for that will be your wisdom and your understanding in the sight of the peoples,” (Deuteronomy 4:6a). The wisdom of walking in the ways of the Lord is the life of God’s people: “And when Moses had finished speaking all these words to all Israel, he said to them, ‘Take to heart all the words by which I am warning you today, that you may command them to your children, that they may be careful to do all the words of this law. For it is no empty word for you, but your very life,” (Deuteronomy 32:45-47a). God’s people who in their folly did not listen to their God, (see Psalm 81), must learn to listen and be wise. The psalmist looks forward to future blessing from the Lord. Psalm 90:14 has the confidence of Psalm 30:5b: “Weeping may tarry for the night, but joy comes with the morning.” But for now, the psalmist knows that God is the dwelling of his people in all generations, those of suffering as well as those of prosperity. For us, Jesus is the wisdom of God, first in our suffering and one day in glory: “He is the source of your life in Christ Jesus, whom God made our wisdom and our righteousness and sanctification and redemption. Therefore, as it is written, ‘Let the one who boasts, boast in the Lord,’” (1 Corinthians 1:30-31). When we are wise, we see that Jesus is our redemption. If we are to boast of God and his work and wisdom in Christ, why is the final prayer of Psalm 90 about our work? “Establish the work of our hands upon us; yes, establish the work of our hands!” (v. 17b) The answer is that God works to make our lives and our work significant. As Paul wrote, “Work out your own salvation with fear and trembling, for it is God who works in you, both to will and to work for his good pleasure,” (Philippians 2:12-13). The blessing of God on the works of our hands is a frequent theme of Deuteronomy: “For the Lord your God has blessed you in all the work of your hands,” (2:7). The Lord will open to you his good treasury, the heavens, to give rain to your land in its season and to bless all the work of your hands,” (28:12; see also, 16:15, 24:19, 30:4-5). The message of Psalm 90 is not “work harder.” There is no comfort in that. Rather, the message is that because God has worked to create and to preserve a covenant people, he will bless us and bless the work of our hands. Here is the beginning of real wisdom and real comfort. In what ways does Psalm 90 come across as a serious, somber poem that expresses in prayer the needs and hopes of God’s people? “Teach us to number our days,” is a phrase in this psalm that contrasts the brevity and perishability of our lives with the eternal nature of God. What sort of incidents cause you to reflect on the shortness and weakness of human life? Why is it important to pray that God will be our teacher in order that we may gain a heart of wisdom? If we are to boast of God and his work and wisdom in Christ, why is the final prayer of Psalm 90 about our work?